Dave is lying beside me. He helped me with my computer needs and I think he is playing Solitaire. He is. I just checked. I used to blog this way. I would set my laptop on my lap and begin to write, often late at night. I was always surprised about what came out and how those words, whatever they were, seemed to have these magical healing properties. I loved that long-ago groove I was in. “You are absolutely right.” I said as we walked passed the new H&M at the new City Creek Center in downtown Salt Lake City. 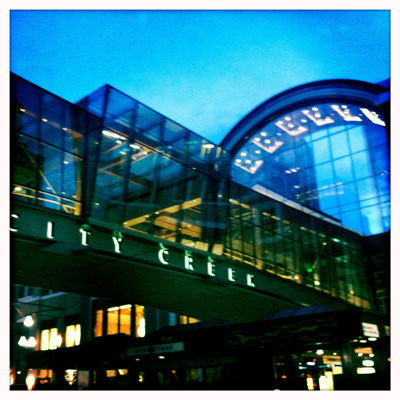 H&M and all of City Creek should open by the end of the month (March 22, so they say). 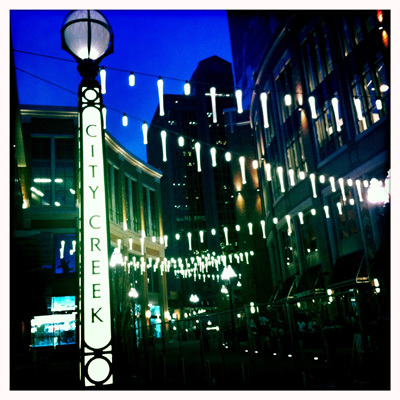 Until tonight I never paid much attention to the City Creek project. Tonight, we walked all around the big city blocks. I loved it. I loved that Dave wanted to see as much we could and peer into the new shops and structures. As we looked around and examine all these new buildings with their food courts, restaurants and trendy stores, I was really impressed with all the stone, the architecture and how Salt Lake City has turned to downtown shopping malls from yesteryear into this new and lovely space. Say what you will about Utah, but this space and the new Urban Harmon’s across the street all completely rock. And today is another reason why I like my family and fall in love with them every time we hit the road. It is Spring. The weather is warm. I know the snow is melted in Salt Lake. 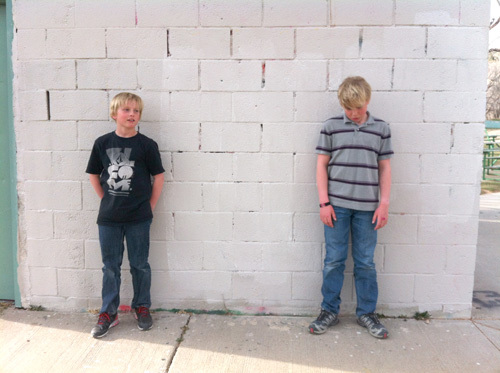 I knew the boys had little homework so I hatched up a plan to head for Salt Lake once the boys were out of school. I called Dave and told him he would be missing out and convinced him to meet us at Kyle’s bus stop and this is how we ended up downtown Salt Lake City tonight. With snacks for all three men in hand, Eli, who I had picked up from his school earlier, and I hit the road. We met Kyle and Dave and were on our way. By 4:30 we reached our first SLC stop, one of our favorite parks. 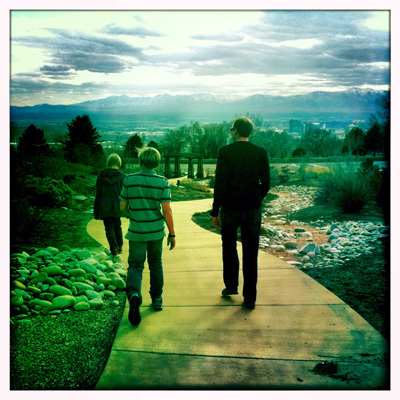 Ever since Kyle’s BFF, Liam, moved to Ohio, whenever we are in Salt Lake, the boys insist we go to this particular park. “Mom, I love this park. It reminds us of Liam.” Of course by the time we arrived at the park everyone had to pee. I honestly thought I would wet my pants. I held strong. We walked to the bathroom and of course found that it was locked; closed for the winter. Behind the bathroom was a tiny canyon path so we decided to walk up it. Within seconds and once we were out of view, I looked to my left, I looked to my right and I looked behind me and saw that I was surrounded by three peeing men. Oh, how I wished I were a dude. “You can do it, Eli. 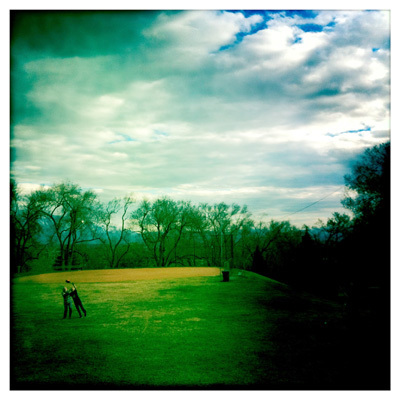 It will be fun.” Kyle said and then I continued, “Eli, look at this view. Isn’t it awesome?” I am sure he wasn’t buying it, but Eli did indulge us. He kept his complaints to a minimum and kept on walking. Here we stood overlooking the Salt Lake Valley. It was sunny warm and amazing. I cold see the snow on faraway mountaintops and said to Dave, “I want to tell our friend Steve, who always harasses me about my Snow-Hate, that this is the kind of snow I love; on faraway mountaintops that appear like you are looking at a postcard.” Dave laughed. We fantasized about what it would be like to live in these neighborhood. No. We are not moving. We always do this. We wander and then wonder what it would be like to live in Hawaii when we are there, both Portlands (Maine and Oregon) when we are there and I even pictured myself living in London, Dublin or Geneva. We always do this and I love picturing us in all these different spaces. Along the way, Dave noticed a shirt, then a sock and eventually we noticed a water bottle and maybe a shoe. We all laughed and made our way from the new park, around a soccer field and across the street to a beautiful new little garden walkway. “I never even knew this was here.” I said. “Mom. look at all these cool stones. I love the view. I could totally live here.” Kyle responded. “Mom. I really love it here.” I loved Kyle’s attitude and loved that he was playing along. Eli was hanging in and we made our way back to Liam’s park. 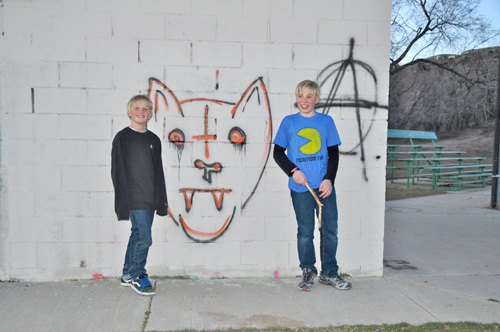 We walked up and tried to show the Dave the evil cat graffiti that was painted on the outside wall of the dugout the last time we were at the park. “Mom, it is gone.” Kyle said, pretending to be sad. I made the boys take another picture in front of the dugout. I watched the boys play football. One of the boys and my husband had a moment and eventually we made our way to another restaurant where Dave had another free birthday meal coupon. And because I was driving when we left the restaurant, and instead of turning right to go back home, I went another direction. I knew it was getting late and I felt like it didn’t matter. “Why don’t we do it as much anymore?” Kyle asked. Oh, how I love this. It seems you mentioned struggling awhile back with control and letting go, but look!! You are an amazing, adventurous woman who loves to be spontaneous. Your guys are easy-going and enjoy going along for the ride. This is great. I miss those moments desperately… The simple things of life, connection, comfort with those you love. Nicely written! Andrea, Stopping at the park and eating your salad sounds delightful. I love those days. Thank you for your kind observations. I love reading what you have to say! Have a great weekend! Kevin, you will have them again. Thanks for your feedback! This is another nice post. I love how you share all the details in your entries. It is almost like I was there. Your boys are so big!! !